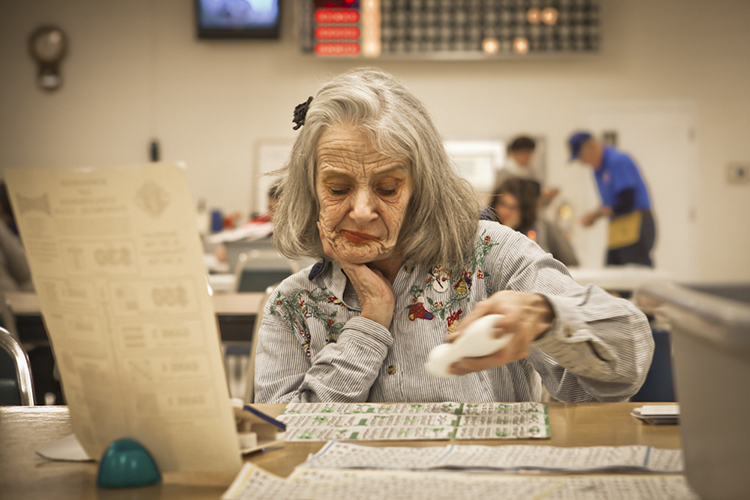 Christmas Bingo In Colorado, from the series "Bingo Culture"
Series Statement: Beginning in 2008, I hit the road for three years to photograph America solo, living out of a tent and bringing along my dog for the ride. While traveling in Maine, I discovered a Bingo hall and it provoked a curiosity about a subculture that I was unaware of. What I discovered was a community of dedicated players who travel to the same place, set up in the same spot, and bring along the same good luck charms with the hopes that this will be the day they win big. Itʼs a place where hope and despair come hand in hand throughout the course of the night. Every location I encountered brought in a true sense of community, each with their unique set of personalities and characters. As I continued my travels and visits to traditional bingo halls across America, I realized I was looking at a cultural phenomenon that will be lost in order to make way for new technologies in gaming and social interaction. Once these dedicated players pass on, so will the bingo halls as we see them today.